1. Short-term treatment of proven duodenal ulcer and gastric ulcer. 2. Maintenance treatment to reduce the risk of relapse in duodenal ulcer. 3. Maintenance treatment for periods up to one year to reduce the risk of relapse in patients with documented healing of benign gastric ulcer. 4. Treatment of gastrinoma (Zollinger-Ellison syndrome). 5. Short-term symptomatic treatment of reflux oesophagitis unresponsive to conservative anti-reflux measures and simple drug therapies such as antacids. 6. Maintenance treatment to reduce the risk of relapse of reflux oesophagitis. 7. Treatment of scleroderma oesophagitis. 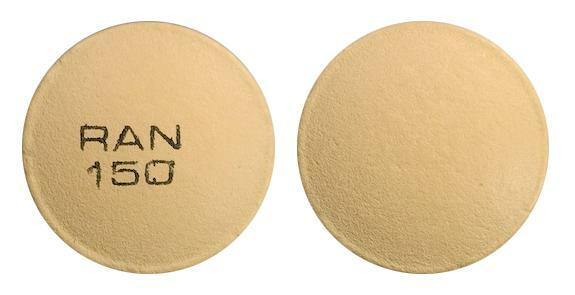 Creamish-yellow, biconvex, film-coated capsule shaped tablets printed with 'RAN 300' in black ink on one side. Creamish-yellow, round, biconvex, film-coated tablets printed with 'RAN 150' in black on one side.